Dozens of people protested in Be'er Sheva and Rishon L'Tzion, demanding that the IDF finish its mission in Gaza. Dozens of people protested in Be'er Sheva Tuesday night, demanding that the IDF follow through and finish its mission in Gaza. The protest was organized spontaneously just a few hours earlier on Facebook, as talk increased in the media of a possible cease-fire between Israel and Hamas. Protestors shouted slogans demanding that the IDF destroy Hamas, and that Prime Minister Binyamin Netanyahu and his government not quit the battle before it is won. There were also numerous calls for the IDF to embark on a land invasion of Gaza. 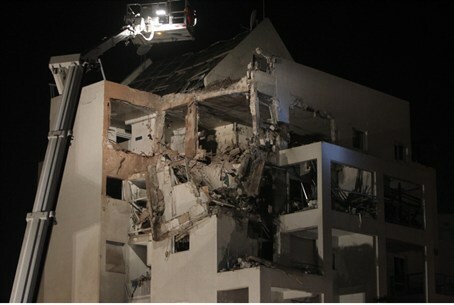 About 20 rockets fired by Gaza Arab terrorists hit Be'er Sheva Tuesday. A building in a residential neighborhood was hit directly, while another rocket hit a busy road in the city, causing a major traffic jam in the city. Meanwhile, in Rishon L'Tzion, where a rocket earlier hit an apartment building, spontaneous protests broke out demanding that the IDF enter Gaza and destroy Hamas, and residents shouted slogans against the government's negotiations for a cease-fire.